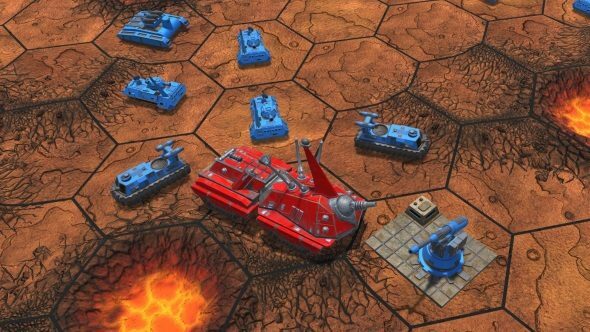 If you’re at all familiar with board games as a whole, you’ll have probably heard of Steve Jackson Games’ Ogre, an asymmetrical game of nuclear mega-tank warfare. First released in 1977 and constantly revised and expanded ever since, it’s a famously quick-fire game of hex-based strategy. It’s been a long time coming, but as of October 5th, it’s now available in digital format with online multiplayer via Steam, adapted by Auroch Digital. No shortage of great strategy games on PC nowadays. Here’s 15 of the best. The concept behind Ogre is simple enough, at least in the most basic of scenarios. One player on defense with a base to protect and a small army of infantry, regular tanks, hovercrafts and more. The second player is typically an attacker with a single Ogre unit, a massive robotic mega-tank capable of simply driving over smaller tanks and attacking multiple targets in a single turn. The Ogre player has the goal of crossing the map, hitting an objective and getting back out alive. On tabletop, it’s considered a fast-paced as far as hex-based strategy goes. Definitely simpler and lighter on the number-crunching than the likes of Battletech. On PC, it seems the kind of game that you can play a full round of in half an hour. The digital version, being no longer limited by the scale of your table, includes a 10-mission solo campaign to teach the finer points of the game a well as a full skirmish mode against AI, with armies of unlimited size and multiple Ogre units per side, if that tickles your fancy.. Looking at the Steam reviews for the game so far, it seems like it’s a mostly authentic adaptation of the board game, albeit with some UI quirks and rule inconsistencies reported – nothing that can’t be patched up. Complaints regarding the quality of the graphics and the time required to play out movement and attack animations are more common though. Even so, this is probably the cheapest, fastest way to get into playing Ogre right now, especially if your friends aren’t close enough to bring to the table.